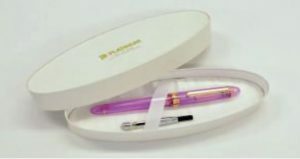 Platinum 3776 Nice Lilas Fountain Pen, Just Announced! Just announced is the new Platinum 3776 Nice Lilas Fountain Pen. This new edition to the 3776 Nice series is named after the Lilac flower, Lilas is French for lilac. Nice of course is a world-renowned resort and tourist city in southern France that boasts the ocean as well as the mountains. The radiant sunshine found in Nice is expressed in the pen translucent resin. Like other Platinum 3776 Nice pens, the Nice Lilas has a demonstrator barrel with ridges that run the length. The color is a stunning pink to match the lilac flower and then the pen is finished with pink gold plated trim. The pen is also fitted with a matching pink plated 14k gold nib. With the Platinum 3776 Nice Lilas, the first 2000 pens come serialized in an oval gift box. Included is a Platinum 700 ink converter for bottled fountain pen inks as well as a Platinum ink cartridge. Inside the cap of every Platinum 3776 Nice Lilas Fountain Pen is the ingenious “Slip & Seal” mechanism the Platinum 3776 fountain pens are known for. This cap design by Platinum creates a complete air lock around the nib to keep the ink fresh and ready to write for extended periods of time. Each of the Platinum 3776 Nice have been special editions only available for a short time and should be in stock mid-February of 2017. Make sure you get your Platinum 3776 Nice Lilas Fountain Pen before they are gone for good! This entry was posted in Fountain Pens and tagged fountain pen, new, Platinum on January 20, 2017 by Pen Chalet.